As my love for vegetables grows, my love for bok choy explodes. I pick up some, almost every time, I go to the store and try to make sure, I have some for the Sabbath. It is an easy vegetable to work with and it adds an element of specialness to any dish. 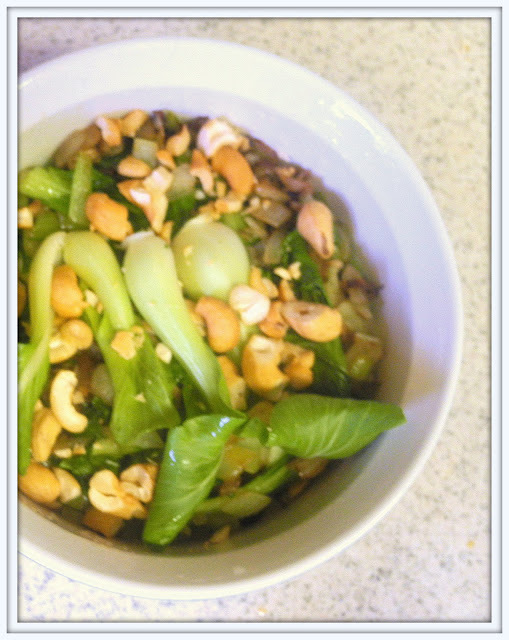 This morning, I looked at my Bok Choy and wondered what to do with it. Rarely, do I make it the star of the dish since it accommodates to almost everything else, I find in my kitchen. Today, I happened upon a dish at Simply Recipes from 2007 and I decided to revive it. Chop stalks of bok choy and slice leaves, leaving big pieces. Heat olive oil in a large sauté pan on medium high heat. Add onions, then garlic, then chopped bok choy. Sprinkle with sesame oil. Cook the baby bok choy until it cooks down - approximately 3 minutes. Lower heat. Stir and let cook for a minute or two longer, until the bok choy is just cooked. This looks great... simple & good.